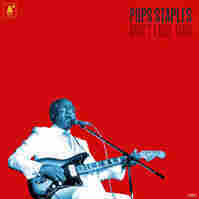 Review: Pops Staples, 'Don't Lose This' The late icon presided over some of the most crucial music of the 20th century. Fifteen years after his death, his final recordings have been completed with the aid of Jeff Tweedy and Mavis Staples. As the patriarch of the Staple Singers, Roebuck "Pops" Staples presided over some of the most crucial music of the 20th century, as his family band lent a righteous soundtrack to the Civil Rights Movement, crafted song standards ("Respect Yourself," "I'll Take You There," et al) and functioned as a cross-genre conscience that spanned soul, gospel, blues, folk and rock music. It's a legacy perpetuated by the great Mavis Staples, among others, long after Pops' death in 2000. In recent years, Mavis Staples' popularity has boomed, thanks in part to her collaborations with Wilco's Jeff Tweedy, who produced and performed on her recent albums You Are Not Alone and One True Vine. Tweedy has also helped push Pops Staples' long-awaited final album, Don't Lose This, into existence more than a decade and a half after the legend's contributions were completed. Without sweetening the sound of Staples' powdery voice and simple but authoritative guitar, Tweedy contributed to the completion of these 10 songs, adding his own work (on bass and guitar) and that of his son Spencer (on drums) to accompany the vocals of Mavis, Yvonne and the late Cleotha Staples. As he's done on You Are Not Alone, One True Vine and his other work as a producer-for-hire, Tweedy largely eschews tricks on Don't Lose This, opting instead for simple, straightforward arrangements. That approach works especially well when the lead voice belongs to Pops Staples, whose message reflects a plainspoken desire for common decency and dignity. Staples often sang about the practical applications of religious faith as it pertains to everyday life on earth; in songs like "Friendship," it's clear that he saw walking a righteous path as inextricable from treating others with kindness, loyalty and grace. Here and elsewhere, faith is more than a vehicle for salvation; it's also a blueprint for living and a much-needed balm. Mavis Staples has described an exchange with her dying father in which he handed her his contribution to these recordings, accompanied by a simple plea: "Don't lose this, Mavis." That's a bittersweet directive — an expression of pride and a dying wish, rolled into one — but it's also a clear-headed statement of ambition and purpose. These 10 songs issue both an epitaph and a valedictory address, while functioning as a worthy distillation of a man who spent his life working to make the world a fairer, kinder and more peaceful place.